One of a kind cuff. 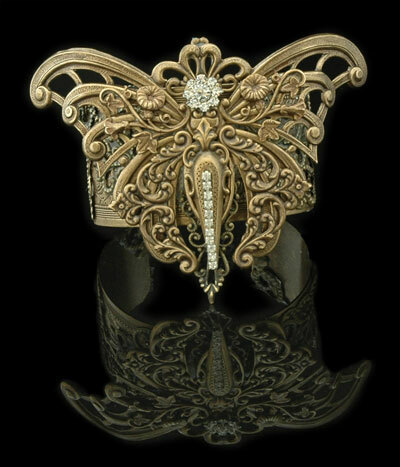 An impressive, huge antiqued brass art deco butterfly is finished with Swarovski crystals, Morning Glories, and lovely flourishes as it rests atop an etched antiqued brass cuff embellished with ornate antique brass filigrees. Cuff is 1 1/4” wide, the butterfly measures 2 ½” long by 4” wide.